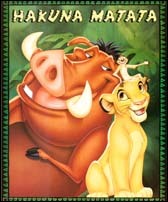 "It means no worries, for the rest of your days; It's our problem free, philosophy..."
The golden rule: Treat others how you would like to be treated! If it’s too good to be true then it probably is. Think before you speak (I’m definitely working on this one). Never ask for anything you don’t demand of yourself: honesty, loyalty, friends and then wealth.